San Francisco – The MAGIC Program’s Back-to-School Celebration and Backpack Giveaway, the largest of its kind in San Francisco, will kick off the academic year Saturday, Aug. 13, by distributing health information, school uniforms and 3,200 new backpacks stuffed with school supplies to kids and teens. The BMAGIC event will be held from 11 a.m. to 3 p.m at the Bayview Opera House, 4705 Third St., and at the Joseph Lee Recreation Center, 1395 Mendell St. The event will also include a neutral-color school uniform giveaway by the Tzu Chi Foundation for children in elementary and middle school. The Mo’ MAGIC event will be held at the Ella Hill Hutch Community Center, 1050 McAllister St., from 10 a.m. to 1 p.m. At the Ella Hill Hutch event, families must visit the accompanying health fair to receive backpacks. Numerous elected officials will be on hand, including Assemblyman Tom Ammiano, State Sen. Leland Yee and Supervisor Malia Cohen. San Francisco Unified School District Assistant Superintendent Dr. Patricia Gray will also be present. The MAGIC Back-to-School Celebration and Backpack Giveaway, now in its eighth year, also doubles as a resource, health and activity fair with free food, games, arts and crafts, music, sports and performances. “Our goal is for every student, regardless of income, to have everything they need so they can focus on learning,” said BMAGIC Director Lyslynn Lacoste. The MAGIC program, initiated by the Public Defender’s Office in 2004, convenes more than 100 community organizations and concerned citizens who work to reduce the number of kids who fall through social service gaps by efficiently coordinating opportunities, support and resources. MAGIC started in Bayview as BMAGIC and was introduced to the Western Addition as Mo’ MAGIC in 2006 at the request of Supervisor Ross Mirkarimi. 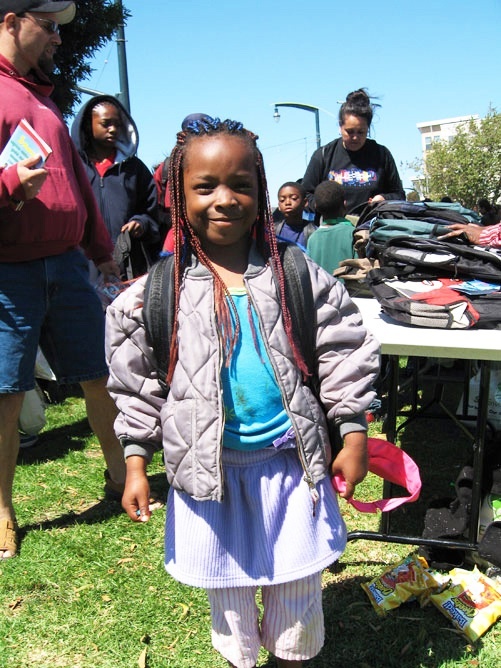 Each year, more than 500 youth and their families receive books at BMAGIC’s Annual Literacy is Freedom Fair. More than 200 youth participate in Mo’ MAGIC’s yearly summer reading program, which provides books and daily reading classes in the Western Addition. “This event is a great opportunity for community to come together and support youth, giving them the tools they need to go back to school prepared − from pencils to toothbrushes, paper to vision screenings. The best part is highlighting education and health, focusing on the impact these areas have on success,” said Mo’ Magic Director Sheryl Davis. This year’s event was made possible by generous donations from Afrosolo, Kaiser Permanente, St. Mary’s Medical Center, Covent & Stuart Hall, Tzu Chi Foundation, the San Francisco 49ers Foundation, Rainbow Grocery, Veritable Vegetable, Bayview-Hunters Point YMCA, Bayview Koshland Fellows, Bayview Opera House, San Francisco Recreation and Parks’ Joseph Lee Recreation Center, Comcast, San Francisco Police Department, California Pacific Medical Center and Third Street Youth Center and Clinic. For more information on BMAGIC, visit www.bayviewmagic.org. For more information on Mo’ MAGIC, visit www.momagic.org. Previous articleLondon police target Black men: You say riots! We say insurrection! I am so touched with the advocacy of this group when they gave backpacks to the children who were less fortunate. It made me so guilty of having too many traveling and bringing on excess baggage. I want to be a part of this group too in order to give back to my community. This type of group work always gives our society a real speed to work together. I really surprised to read the news of giving to the poor kids backpack. They really want to have a good backpack for going somewhere or school. They will surely encourage by getting the backpack although they have not paid for!